SAFETY FIRST: The line was long for Boone County residents dropping off hazardous waste products Saturday at the Boone County Highway Department. 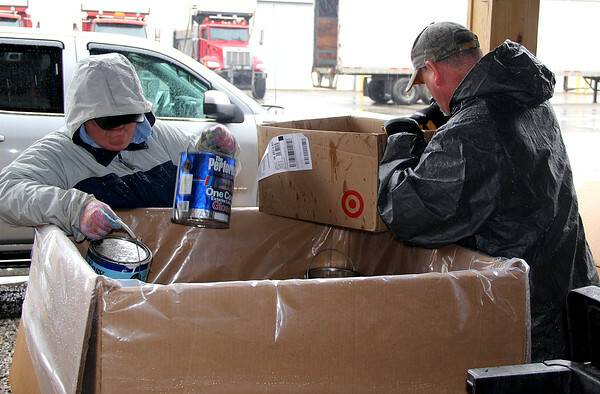 NuGenesis workers Lois Rester (left) and Randy Inman drop paint cans into one of many pallet boxes. "We take all of this stuff to our facility in Mooresville," NuGenesis president Jim Parker said. We incenerate the flammables, recycle the lead-based items, the electronics go to a certified processor, and corrosive acid material go to a speciality processor." Pallets of TVs, paint cans, spray paint, light bulbs and more were spread throughout the dropp-off area. NuGenesis workers asked that people stay in their cars, and they unloaded them.